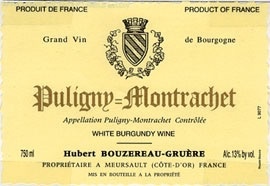 Wine Domaine Hubert Bouzereau Gruere & Filles Puligny Montrachet 2016 - Royal Wine Merchants - Happy to Offer! A parcel of land called “Les Houillères” located on the edge of Chassagne-Montrachet. Much freshness and finesse; the nose expresses acacia, hazelnut, toasted almond, vanilla, and white pepper.